MODULARLY STRUCTURED SIDE PART WITH MOBILE FOOT. QUICKjump – a modularly structured side part – is the latest development from the manufacturer of equestrian sport equipment and it offers decisive advantages in transport and storage. It is manufactured of three white – or on request coloured – powder-coated components of dimensionally-­stable and weather-resistant aluminium: two mobile foot elements, as well as the base frame con­struction. Assembly is executed in two steps: The elements are connected together via a simple insert system and then force-locked through bolting. In dismounted status QUICKjump enables a space-saving stacking without having to slide the elements into each other in a complicated manner. Simply placed on top of each other, each element is separately fixed in place, the frame construction and the mobile feet can transported or stowed. The space that is saved through this design makes it possible to deliver three times the number of side parts, particularly for transport via truck or container. An option that not only has more to offer, but also pays off through reduced freight costs. QUICKjump can be set-up at lightning-speed, even if requirements are urgent. The modular structure of the base variant even makes postal dispatch possible. 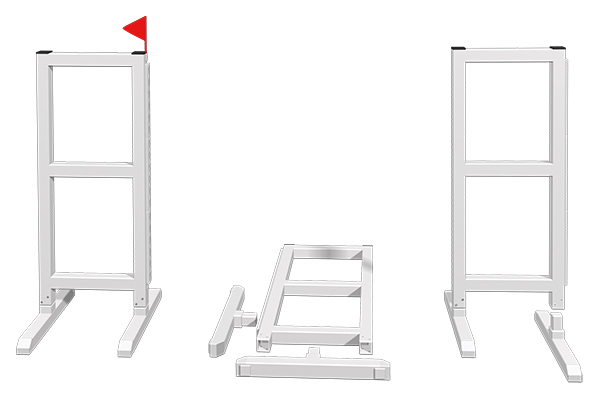 There is space in a portable package for two side parts, which are delivered as a complete set, including pre-assembled rail, cups and flags. On request, all side parts of the ALUMINIUM series can also be implemented as QUICKjump variant with mobile feet. Our team would be pleased to answer any questions you might have concerning the new modular side part.